Charles "Evans" Harbaugh was born on Feb. 10, 1861 on a farm at what is now Clairton Lake near Scullton, Somerset County, PA, the son of David and Mary Magdalene (Whipkey) Harbaugh. 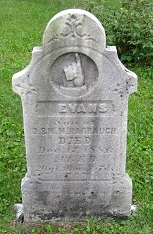 Little is known of Evans' short life. As a three-year-old boy, he would have seen, but barely remembered his father leave home to join the Army during the Civil War. When he was a young man, Evans had a photographic portrait taken, seen here, which is colorized and imprinted on metal. In December 1881, tragedy struck when Evans became deathly ill, during a wave of typhoid fever that swept through the mountain community. He fought the infection, but could not surmout it. He succumbed on Dec. 17, 1881. In a brief obituary, the Uniontown (PA) Republican Standard said he "He was a fine young man, aged 21 years." His death was a great shock to his parents, brothers and sisters. He is buried in the family plot at Imel Cemetery near Clay Run, Fayette County, PA. As part of the family's grief, his name and date of death were dutifully inscribed in writing inside the family Bible. Over the years, the memory of Evans dimmed, but did not fade completely. His photo portrait hung for years in the home of his sister, Letitia Stoner, in Illinois. In 1947, when the book Harbaugh History was published by the Coopriders, he was named in the volume. His grave marker was standing upright and legible when photographed by the founder of this website in June 2013.